I can’t help feeling that there is a certain amount of circular argument going on here. It seems clear that each model is tuned to match past temperature trends through individual adjustments to external forcings, feedbacks and internal variability. Then the results from these tuned model are re-presented (via Figure 2 above) as giving strong evidence that nearly all observed warming is anthropogenic as predicted. How could it be anything else ? Despite this we then read in chapter 9 that. The AR5 explanation for the hiatus as given in chapter 9 is basically that about half of the pause is natural – a small reduction in TSI and more aerosols from volcanoes, while the other half is unknown – including perhaps oversensitivity in models. How much of this inter-model variability has actually all been hidden under the ANT term ? So I went back to chapter 10 of AR5 to try and understand what exactly model hindcasts are saying. Gavin insists that models are NOT tuned to match past temperature data. My conclusion is that he is right and the models are not themselves tuned. Instead the external forcings are tuned! Evidence for this can be seen in Figure 10.1 as shown below. The key plot for me is d) which shows the total forcing for each model instance in the ensemble. They are ALL different. So each model has different values for GHG forcing, and for natural forcings. How exactly are these determined ? Do they all use the same basic data – CO2 levels, Volcanic aerosols, natural forcing ? If so why are those models that grossly overshoot or undershoot the temperature data not simply rejected ? Most other branches of physics end up with a standard model which simply works until eventually disproved. So I am confused – unless the real intention is to increase the error bands on CMIP5 ensemble projections to cover uncertain natural variability into the future. Update 13/10: I still haven’t been banned only getting a small amount of abuse yet still getting reasonable answers…..
For Clive Best: You’ve been fed a line and swallowed it. “Tuning” stories are often the same sort of deceit. “Tuning” means fitting the physics, not matching the past. You say “Tuning” means fitting the physics, not matching the past. I agree that this is an honest procedure if normalization is done just once and then fixed in time. I also accept that such models indeed reproduce well the observed warming 1950 – 2000. Maybe I am just being thick here – but please can you explain to me then why these normalized CMIP5 models end up with such different external forcings as shown for example in Fig 10.1 d) in AR5 ? Does this not reflect variations in climate sensitivity of the underlying physics between models ? If so how do we make progress to determine the optimum model ? Is it even possible to have one standard climate model ? This entry was posted in AGW, Climate Change, climate science, GCM, Science and tagged Climate Change, CO2, IPCC. Bookmark the permalink. This in fact lies close to my long held position. I would say “perhaps as much as half”. But for holding this view I have been vilified by some as a “Flat Earther”. My current view actually fits into the bottom end of the IPCC spectrum. All the IPCC needs now is a leader like Blair to seamlessly slide into the shoes of the sceptic camp and claim victory for “the science”. Good on you, mate, for bearding Gavin in his den, and keeping your cool in the process. Do keep this post updated, if you will, and let us know the outcome of the discussion. Kiehl, J. T. (2007), Twentieth century climate model response and climate sensitivity, Geophys. Res. Lett., 34, L22710, doi:10.1029/2007GL031383. Knutti, R. (2008), Why are climate models reproducing the observed global surface warming so well?, Geophys. Res. Lett., 35, L18704, doi:10.1029/2008GL034932. Thanks – some interesting papers. Typo alert: The first line says “I posted the following comment on RealScience today”, but the link goes to the RealClimate website. seems to be a good one, and got a rather waffly reply from Gavin about ‘degeneracies in the footprint’. There’s another figure, 8.16, that seems to support your comment and does not fit Gavin’s answer. It shows a much wider pdf for ‘total anthro’ forcing than GHGs. Yes – Gavin tends to reject such observations as simply being dumb ! 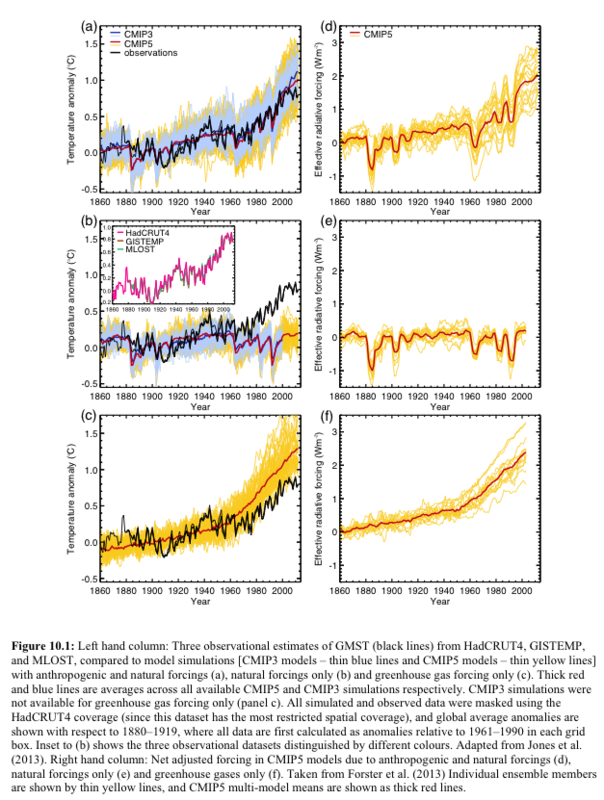 The results of multiple regression analyses of observed temperature changes onto the simulated responses to greenhouse gas, other anthropogenic, and natural forcings are shown in Figure 10.4 (Ribes and Terray, 2013; Gillett et al., 2013 ; Jones et al., 2013). The results, based on HadCRUT4 and a multi-model average, show robustly detected responses to greenhouse gas in the observational record whether data from 1861–2010 or only from 1951–2010 are analysed (Figure 10.4b). The advantage of analysing the longer period is that more information on observed and modelled changes is included, while a disadvantage is that it is difficult to validate climate models’ estimates of internal variability over such a long period. Individual model results exhibit considerable spread among scaling factors, with estimates of warming attributable to each forcing sensitive to the model used for the analsys (Figure 10.4; Ribes and Terray, 2013; Gillett et al., 2013 ; Jones et al., 2013 ), the period over which the analysis is applied (Figure 10.4; Gillett et al., 2013; Jones et al., 2013), and the EOF truncation or degree of spatial filtering (Ribes and Terray, 2013; Jones et al., 2013). In some cases the greenhouse gas response is not detectable in regressions using individual models (Figure 10.4; Ribes and Terray, 2013; Gillett et al., 2013; Jones et al., 2013), or a residual test is failed (Ribes and Terray, 2013; Gillett et al., 2013 ; Jones et al., 2013), indicating a poor fit between the simulated response and observed changes. Such cases are probably due largely to errors in the spatio-temporal pattern of responses to forcings simulated in individual models (Ribes and Terray, 2013), although observational error and internal variability errors could also play a role. Nonetheless, analyses in which responses are averaged across multiple models generally show much less sensitivity to period and EOF trucation (Gillett et al., 2013; Jones et al., 2013), and more consistent residuals (Gillett et al., 2013), which may be because model response errors are smaller in a multi-model mean. I cannot understand how this explains to me why the fingerprint ‘ANT’ error is very small whereas that for ‘GHG’ and ‘AER’ are very large ! I’d say this is largely a wordplay. We may say that models are “evolved” to match observations, if “tuning” is such a bad word. How is model made? You take laws of physics. You take observations. You do a lot of analysis and regressions. You make up a few educated guesses. You feed computer with all this and then you run the model. Then quality control comes and says yes or no. Yes if the model behaves, no if it doesn’t behave. Repeat it for sufficient number of cycles and you got a great example of natural selection in practice. And when the model behaves? When it matches observations, of course. Models are no better than their inputs – physics implementation, observation analysis, regressions, educated guesses. And quality control. If simulation of oceanic cycles wasn’t priority in quality control, models didn’t have to simulate it. If following the temperature trend was priority in quality control, models evolved to follow it. the modells do not show the rapid warming around 1910 and 1940. there are faktors missing between week modelled 0,1K/30a and the observed 0,4K/30a. maybe the insolation “tuning” ist to week in all this modells.